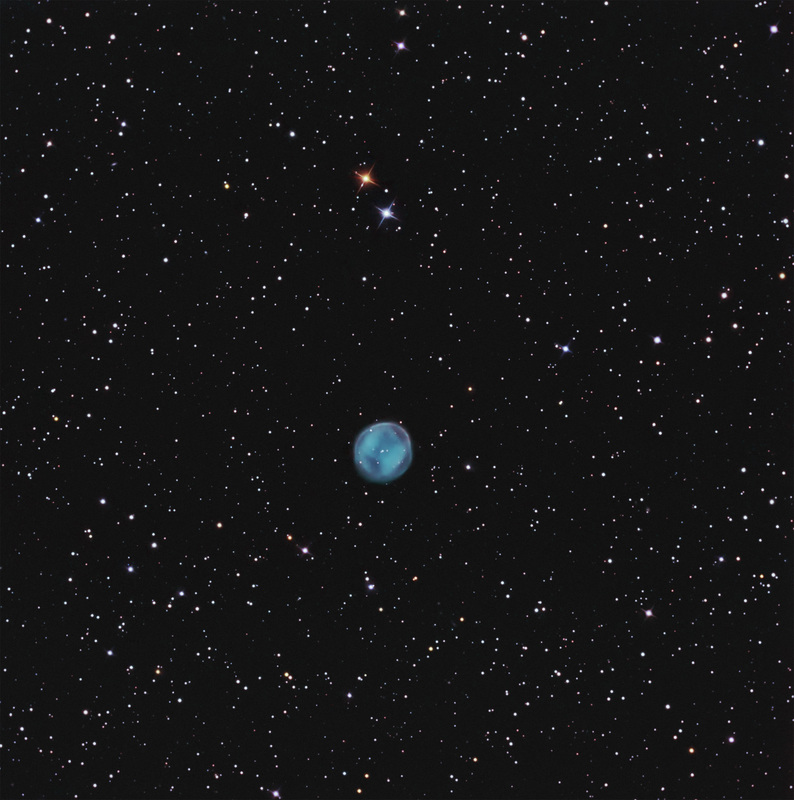 The Southern Owl Nebula (PLN 283+25.1, K1-22 ) is a magnitude 12 planetary nebula (PN) about 2′ apparent diameter in the constellation of Hydra midway between the Southern Ring Nebula (NGC 3132) and Antennae Galaxy (NGC 4038). Its informal name relates to its northern cousin, The Owl Nebula (M97) in Ursa Major, due to its similar appearance. This informal name was coined by Jay McNeil in his January 1999 Sky and Telescope article “Little Known Planetaries”, page 128. The image is ~ 41′ x 41′ and north is up. I could find little information on this object. Soker (Astr. J. 118, pp 2424-2429, Nov 1999) suggests that this PN has a biniary conpanion for its central star separated by 470 AU and an orbital period of 8510 years. Although I could find several sketches from visual observations, actual images are rare. The color was based upon 2 hours of Astrodon Generation 2 RGB data, augmented by 6.67 hrs of Astrodon 3 nm OIII and 3.67 hrs of 5 nm H-a. There is a bright ring at the periphery of the nebula, suggesting that we are viewing the edge of an expanding bubble, The bright internal lobes suggest axes of symmetry that are diagonal in this image (NE-SW, NW-SE).